I had the chance to catch up with Josh Scogin lead singer and guitarist for ’68. Check out what he had to say about their new record and the future of the band! Jenn: Your first full tour with ’68 just concluded, how did it feel to be back on the road again? Josh: It feels good. It was about the longest time I’ve spent home in my life. It was very exciting to be back on the road. I’m very grateful to be back on the road so quick. Jenn: How was this tour different than tours you’ve been on in the past? Josh: Everything’s different. From 5 in a van to 2 dudes, to playing guitar. Nothing is the same. It was a great tour. I wasn’t familiar with the bands as people going into it. It was a lot of new faces and it was great getting to meet them. Jenn: How has the recording process been different for ’68 than it was for The Chariot? Josh: Less cooks in the kitchen. Having many people isn’t a bad thing. It’s just different. Decisions were made a lot faster with 68. It was a snowball effect. We moved forward and didn’t look back.. Very different personally because The Chariot ended our last tour in November I was in the studio with ‘68 in December. I went to the studio a week early and wrote all of the songs in about a week. I had ideas before hand but for the most part I locked myself in a room and wrote 3-4 songs a day. When we started recording our drummer would hear the song in the morning and it would be recorded by the night. When everyone else called it a night I’d be back in the room to write another song. One song was written on the spot, our producer Matt Goldman got a phone call and I picked up guitar and accidentally wrote one then. Woke up and the song didn’t exist and it was written and recorded, minus vocals, before bed. I find I work well under pressure and it adds to the chaos of the music. Its very easy to over think things but rock and roll, maybe its not supposed to be overthought. I trust my gut instincts. Jenn: What goals do you and Michael McClellan have for ’68? Josh: I’m not much of a goal-oriented person; the only goal is how much noise can two guys make. It’s easier and more rewarding to enjoy the journey and as the goals come put a check mark. Jenn: What goals have you checked off? Josh: First tour done, currently in the process of a small run in Russia and Europe. I love travelling, I think that may be the point of the band to go as many weird places as you can. Jenn: What have you learned in the past with music and how has that shaped where you would like to go with ’68? 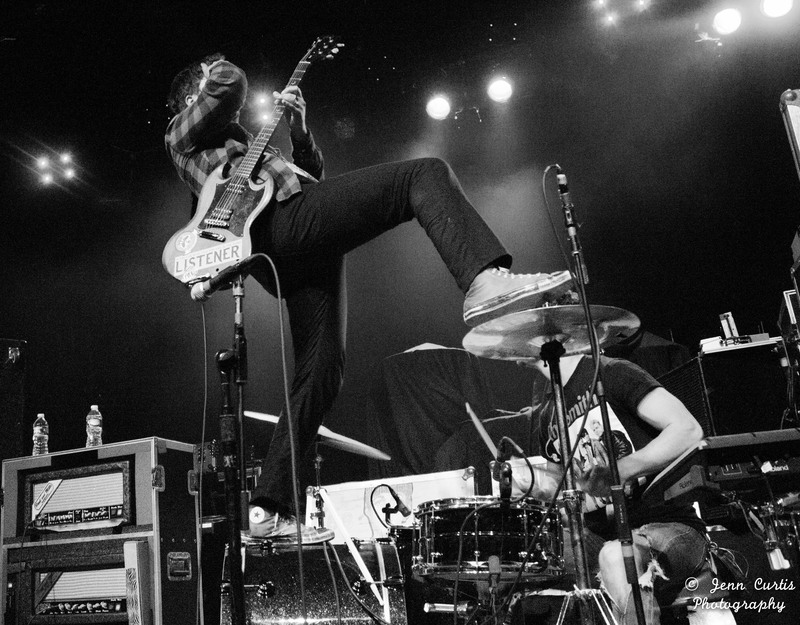 Josh: One thing The Chariot always taught me was to treat every show as its own brand new thing. With bands every variable that can be different is different at every show. One show you have a different set of kids, sound system, night of the week, except the band and the set they play. I feel like every night can be its own night and its own thing. I think bands miss out a lot on being able to adapt to every night. With The Chariot we never used setlist so for us it was very rewarding. We planned things on the spot and for me its more rewarding; it fits that night and how things are supposed to be for that night. With ‘68 it’s who I am now. With us it’s a lot easier to keep things new and stay on our toes. It keeps things fresh. You as an artist will play songs 300 times a year even though kids may only hear it once themselves you need to keep things fresh. Jenn: What are you most excited about with this album? Josh: Its our first record and getting it out. I enjoy the mystery. People came up saying they didn’t know what to expect. I haven’t had a blank slate in 10 years. No preconceived notions going into it. It will also be nice when it’s out to have it out and living its own life. Then figuring out the second record and what it’s supposed to be. Jenn: What is your favorite song off the record and why? Josh: I enjoy them all. Jenn: What has been one of your favorite memories from your time spent touring? Josh: Travelling the world and learning about other people’s cultures. Learning about where other people come from. I remember standing in Russia for the first time, I never imaged being there let alone it going really well. It’s amazing to have been there 3 times and going back. Jenn: Anything to say to fans? Josh: Thank you so much for giving us a chance. I’m very appreciative! Come see us live!